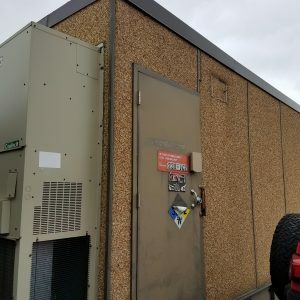 Aggregate Shelters - UsedShelter.com - Used Telecom Shelters & Cabinets for surplus/bargain prices! Equipment shelters are most often very utilitarian in appearance; they are designed to be useful rather than architecturally beautiful. Yet many business park developments, city and municipal groups have demanded that equipment shelters be at least somewhat more aesthetically pleasing than standard painted metal boxes. Aggregate siding gives equipment shelters a greater aesthetic appeal. Aggregate shelters are basically concrete, fiberglass, or steel structures clad in aggregate exterior panels. And although the aggregate exteriors “tone down” the utility box appearance, they also serve some valuable additional functions. The panels of aggregate siding give equipment shelters greater protection against the elements, and aggregate siding insulates the shelter more fully. The siding is (generally) backed with a layer of insulation to help seal in warm or cool air. That insulation also provides a more effective sound reduction barrier, meaning that less outside noise intrudes into the shelter. Aggregate siding is a more “green” product that offers greater sustainability. The green factor appeals to many communities and organizations that are focusing more attention on reducing off gassing in their construction projects and daily operations. Aggregate is typically made of recycled stone or brick, Portland cement, polymer content, and mineral oxide pigments. Aggregate shelters are essentially maintenance free, durable, weather, vandal, and bullet resistant. Tower Direct’s inventory of aggregate shelters includes structures from such well-known manufacturers as Kullman, Sabre Building Systems, Thermo Bond, and Oldcastle. Contact Tower Direct about availability, details, and pricing of aggregate shelters.